Excellence of service: We believe that everyone wants to be on a winning team and in our business that means outstanding service to our clients. 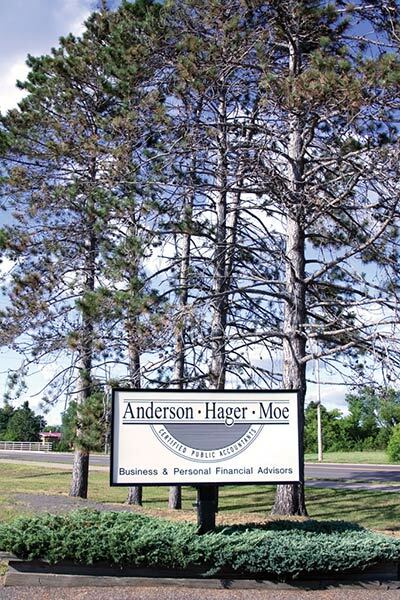 Anderson, Hager, and Moe has a reputation for integrity, dependability, and quality of service. Anderson, Hager, & Moe S.C. participates in the peer review process endorsed by the Peer Review Board of the American Institute of Certified Public Accountants. The process consists of other CPA firms performing a thorough examination of the way we conduct our accounting and audit practice and reporting their findings. Anderson Hager & Moe continually receives no comments, which is the highest level of competency available. We also received the 2007 Exceptional Service Award. What better environment to grow a career? Opportunity: We are blessed with a diverse and growing business community in our region. With a foundation of excellent client service and a commitment by our partners to grow, the firm offers motivated individuals every opportunity to achieve their career goals. Location: We live in Wisconsin’s beautiful Northwoods where opportunities for outdoor activities abound. Instead of long commutes in traffic and exhaust, we enjoy commutes through beautiful woodlands and past idyllic farmsteads to our offices where we are greeted by the fragrance of the towering pines that surround our offices and are abundant in our communities. Speaking of communities – many of us in the firm are leaders in our communities and are active in making them better places to live and raise a family. Fun: We work hard, but we also play hard as demonstrated by two firm sponsored trips in the last seven years, annual Christmas parties and summer parties, and informal, unscheduled parties, lunches, and get-togethers. We think it’s important that we like those we work with and that we count each other as friends as well as co-workers. Further, while we work hard during the winter, the firm encourages extra vacation and time off to spend with family and friends during the summer and fall. Top-notch individuals are welcome additions to our team. Please contact us by submitting your cover letter and resume to Larry Peterson at lpeterson@ahmcpa.com.